Recently, I finished my yearly read-through of The Chronicles of Narnia. Each time I read them or listen to them, something new strikes me. This time, the concept of adventure stood out to me. 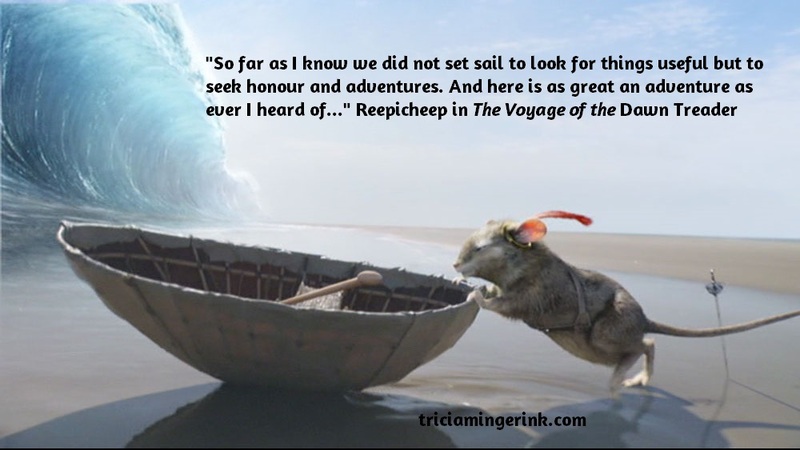 In The Voyage of the Dawn Treader, Reepicheep is always harping on honor and adventure. The little mouse’s courage pushes everyone on the crew to greater heights of courage because they refuse to be outdone by a mouse. The others sometimes become annoyed with Reepicheep because everything is an adventure to him. Any time they want to turn back or be cautious, Reepicheep pulls the adventure card, and they can’t turn back. But for all his annoyance with Reepicheep, King Caspian seems to have remembered Reepicheep’s words because in both The Silver Chair and The Last Battle, descendants of King Caspian also emphasize adventure. The amazing thing about these quotes? They all happened, not when the characters were facing something fun and safe, but when they faced danger and a great possibility of death. Actually, death was the most likely outcome. Yes, that’s the point. Everything in our life is God’s adventure given to us. The good things. The bad things. The horrible things we’d rather never, ever face. Everything in between is an adventure. As Reepicheep would say, it is the greatest adventure that has ever been heard of. But we don’t always treat life as an adventure. We live like it’s the dullest thing ever. A lot of times it is, but even epic voyages had long days of sailing on boring, empty seas with barely a breeze to push the ship along. But that’s still part of the adventure. You can’t get to the next island without the boring sailing in between. This was something I’ve been thinking about even before re-reading The Chronicles of Narnia, which is probably why it struck me this time. I’ve been thinking about it ever since reading A Time to Die by Nadine Brandes, a book that asks the question: how you would live if you knew when you’d die. Would you live your time or would you waste it? And when you find you have time, what do you do with it? That’s one theme of the sequel A Time to Speak that releases on October 16. You’ll be hearing a lot more about that book since I’m a part of Nadine’s launch team and it’s made me think a little more about what I’m doing with the time I’ve been given. God has given me this life, this adventure. It can be scary. Overwhelming. Adventures usually are. But that doesn’t mean I can’t be a little bit more like Reepicheep and face it with courage and an adventurous spirit. Because what biggest regret is there than turning back and leaving an adventure undone? What about you? What adventures has God given you? Thank you for this post! ^_^ Blessings!